These days the new health rage is seeds like chia seeds, hemp seeds, flax seeds, any thing that is coconut, mixture of fruits and vegetables. The list is endless. Even before chia seeds came onto the market, India has been using falooda seeds, Basil seeds or takmariya or sabja as its commonly known in faloodas and added in milk to give a cool refreshing drink. I remember pestering my mum to add spoonfuls of takmariya in my milk. She would tell me that too much is not good. Contrary to her belief basil seeds and chia seeds are very healthy. There are slight difference between basil and chia seeds. While basil seeds are derived from basil plant which is mainly found in the Mediterranean region and Indian Sub -Continent, chia is derived from a plant called Salvia Hispanica, a type of mint mainly found in Mexico and Guatemala. The word chia comes from the Aztec word which means strength. Chia seeds can be eaten raw or soaked whereas basil seeds have to be soaked. Basil seeds are balck tiny seeds whereas chia seeds are oval in shape and can be grey, black, white or brown in colour. When soaked basil seeds form a gelatinous outer coat within a few minutes whereas chia seeds need to be soaked for a longer time. However both have health benefits. They are rich in iron, magnesium, calcium, omega 3, potassium,protein and fiber. 2) Rich in fiber makes it very freindly for your digestive system. Prevents constipation, helps to reduce acid reflux. 3) Regulates blood sugar because it contains alpha-linolenic acid. 4) Its an energy booster. 5) Because of its high calcium content, its good for your bones. 6) Chia seeds can hold up to 12 times its weight in water. Usually the chia water ratio is 1:10. This helps to ward off hunger pangs and makes you feel full for a longer period. To read more about the benefits of chia seeds, read this. For our 40th #FoodieMonday#Bloghop the theme chosen was #summercoolers. My initial idea was to make a cool refreshing mocktail. However, since last Monday the weather here has changed from extreme heat to cool rainy days. Not exactly the type of weather I want to nurse a cool mocktail. Making chia pudding has been on my ‘to do list’ for a very long time. So I decided to make this cool pudding. This pudding can be served as dessert, as a snack, or even for breakfast. Before I introduce you to the exact recipe, you can use fruit puree or chopped fruit to add to the pudding. You can use normal milk, coconut milk, any nut milk or soya milk. Top it up with your choice of fruits, nuts, grated coconut or a bit of dark chocolate. I decided to use kiwi fruit puree. Check out the recipe and prepare for your family and you a healthy pudding. Strawberries are in abundance right now in Montreal. After our long walk in the evening, we are looking forward to some dessert. I made chia seed pudding using strawberry puree. Loved the dessert. Follow the basic recipe as below but replace the kiwi with strawberry. Mix milk, maple syrup and vanilla extract in a bowl. Let the mixture stay at room temperature for 30 minutes. Put the mixture in the fridge for 5-6 hours or overnight. Peel the kiwi fruit and puree it. Leave it in the fridge to chill for 30 minutes. Just before serving mix the fruit puree and chia seed mixture. Top it with nuts and fruits. Use normal milk, almond, cashew nut milk, or soya milk. Some fruit suggestions are mango, berries, banana, pineapple. Use any fruit that you like. Add spices like cinnamon or flavours like zests to it. After 30 minutes of soaking, mix the mixture again as the top layer of seeds with not form the gelatinous outer coating. So different and innovative..lovely share. 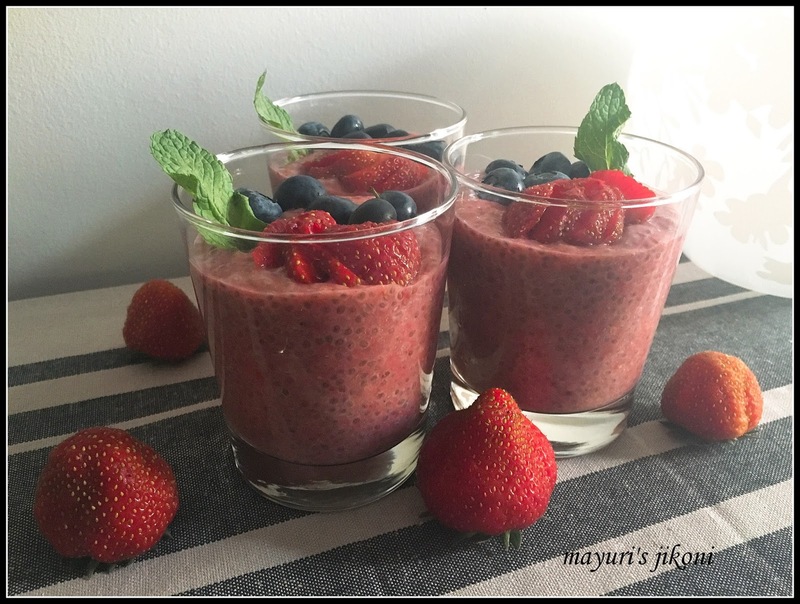 Loved the healthy pudding recipe idea with Chia seeds. Perfect to stay energized during summer. Really a healthy treat!! !thx for share..
Use them Alka, they are good and filling. Thanks Nisa, do try the dessert. Kids too will love it. Sure Pushpita, good way to stay energized and a good cool treat too. This pudding looks great and I am sure its super tasty. I love basil seeds and also chia seeds which I use in smoothies a lot. This pudding looks so healthy and I have all these ingredients to hand so must try it as I keep forgetting to use my chia seeds! This is so healthy, chia seeds, kiwi fruit…what more can 1 ask for!!! I have never used chia seeds..but this pudding looks so healthy and love to try them soon mam!! Thanks for the super healthy recipe Mayuri. Perfect yummy and healthy summer drink. I have, recently, started using chia seeds because my 13 yr old daughter has resolved to becoming a vegan. Will definitely try chia with strawberries. Roopal, I'm glad you liked the recipe. I made it again with blackberries but couldn't take any photos.Mango one must have tasted great. Waagmi, they are suppose to be healthy and a tummy filler. I use them all the time in my porridge, cereal, smoothies too. Thanks Nayna.. it surely is a healthy treat. Hope you have tried the pudding Camilla and loved it. Thanks Jolly, its a healthy way to have desserts. I'm sure your daughter will love this pudding. Simply Vivacious: I am the One I seek. I am my own beloved. I absolutely love chia seeds and every morning they appear in my porridge..such a delicious and yummy pudding.